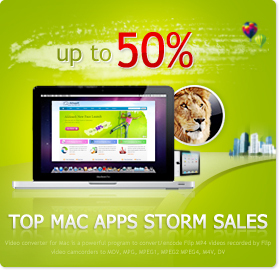 To celebrate the new release of the top Mac apps, alifesoft.com is about to give a great discount on the newly-released Mac software and its popular top Mac apps, including the best-selling video converter for Mac, video editor Mac, PDF converter for Mac, DVD ripper for Mac, iPad video converter for Mac. Alifesoft Studio is a professional software developer specialized in Mac software developing and distributing. It is dedicated to offer the best deals and reviews on the top Mac apps to spark your Mac life. Now this summer new release sales gives up to 40% off for some of the best Mac apps, start from August 1 until the end of August 31, a long time for you to free try and catch the best deal. But do remember to use the coupon code "ALIF-0B0U", copy and paste it when checking out. And bear in mind the offer is still time-limited though it's longer than some of the previous deals. iPad Magic Platinum for Mac - combined iPad transfer, DVD to iPad for Mac, iPad video converter for Mac, iTunes Syncpod, free media player, iPhone ringtone maker, iPad photo manager into one; designed for Mac and new Apple iPad tablet fans to backup or manage your favorite movies and music on your Mac to iPad, and transfer iPad contents to Mac and vice versa. iPhone Magic Platinum for Mac - offers iPhone users an easy way to manage and backup iPhone files, to transfer iPhone files to Mac or backwards, and integrates the DVD to iPhone for Mac, iPhone video converter, iPhone ringtone creator, Photo manager and editor, etc. into one. iPod Magic Platinum for Mac- makes it easy to copy and backup iPod files like music, videos, and photos from your iPod to Mac and vice versa. Not only can you transfer iPod files to your iPod with this iPod ripper, but you can also copy DVD movies and rip non-iPod video/music format files to iPod by first converting them to iPod supported formats, make iPhone ringtones from video/audio files, download and convert online videos to iPod in one step.